Applications for the 2019-2020 class of the LeadingAge North Carolina Leadership Academy are now being accpeted. 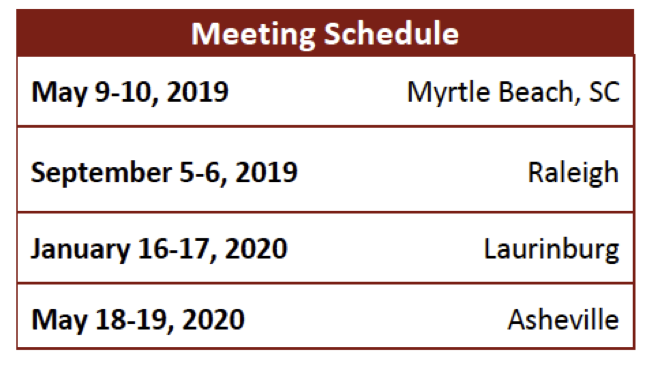 The first meeting of the class will be at the Annual Conference in May 2019 at the Marriott Resort and Spa at Grande Dunes in Myrtle Beach, SC. The deadline to apply is March 8, 2019. The LeadingAge North Carolina Leadership Academy is a year-long program designed to develop statewide aging services leaders. The program provides a challenging and engaging learning environment that enhances the leadership capacity of aging services professionals so they are better equipped to serve our field. Click here to download the flyer for more information to familiarize yourself with the program. Click here to submit your online application. The program is available to anyone who works for a LeadingAge North Carolina member community irrespective of clinical or managerial experience. Leadership potential within one's organization is far more important than specific job title. We encourage the identification and application of staff that are emerging leaders within member communities. Each member community is limited to one nominee. The Leadership Academy Curriculum draws on adult learning theory to delve into the core principles of transformational leadership, person - centered care and innovation. The program emphasizes self - awareness and relationship building through a variety of education methodologies. Traditional and experiential learning methods are used to create an environment in which Fellows learn from their own experiences, from one another, from the coaches and design team, and from leaders and experts in the field. Work Life Balance – to reflect on our values, beliefs and philosophy and to appreciate the value of presence and being in the moment. During each face-to-face meeting, Fellows engage in group exercise and discussions of ways (and contexts) in which leadership theories can be applied to real- world settings in and outside the aging services field. The use of reflective, creative and interactive education techniques helps Fellows embrace diversity of thought, move beyond pre - conceived assumptions and view their own experiences and those of others as teaching moments/opportunities. Selected site visits are designed to expose Fellows to innovative organizations across the aging services continuum and the visionary leaders who enable transformation. Hearing about these organizations and the contributions of staff (at all levels) responsible for creating unique care environments and programs allows Fellows to gain a deeper understanding about the aging services field while witnessing the traits of impactful leaders. Fellows interact with not-for-profit aging services leaders and other field experts, engaging in intimate dialogue about influencing change and promoting innovation in their organizations and communities. The program’s interactive nature demands a high level of participation and requires that Fellows complete all projects, assignments and readings as well as attend all program-related meetings, site visits, sessions and conference calls. In the event that a Fellow no longer meets the program’s eligibility criteria, including being employed by a supporting LeadingAge NC member organization, his/her continued involvement in the Leadership Academy is subject to review and should be brought to the attention of LeadingAge NC staff. Upon acceptance, a $1,700 tuition payment (non-refundable and non-transferable) is required from each LeadingAge North Carolina Fellow organization. Tuition includes meeting materials and meals provided during sessions. Lodging and travel expenses will be incurred by the member community. LeadingAge North Carolina provides complimentary registrations for each LeadingAge North Carolina Leadership Academy Fellow to attend the 2019 Annual Conference and Trade Show May 6-9, 2019 at the Marriott Resort and Spa at Grande Dunes in Myrtle Beach, SC and the 2020 Annual Conference and Trade Show May 18-21, 2020 in Asheville, NC. This program is only available to individuals employed with a LeadingAge North Carolina member community. Reminder, only one applicant per community will be considered. If a Fellow’s employment status changes or if he or she fails to meet any of the programs eligibility criteria, continued participation in the Leadership Academy is subject to review by LeadingAge North Carolina. Apply online here. All completed applications must include a personal data form, leadership essay and current photo. The application deadline is March 8. You may download the 2019 Leadership Academy flyer in pdf format here for more information. * Please Note: The Letter of Commitment must be signed by the President, CEO, Executive Director, or Administrator (where appropriate) of the applicant’s organization. If the applicant is the highest ranking executive officer, the organization’s Board Chair should sign the Letter of Commitment.